It is meant for people who could not get into Google Summer of Code for various reasons, or people who simply prefer a differently structured, somewhat less constrained program. Season of KDE is managed by the same team of admins and mentors that takes care of Google Summer of Code and Google Code-in matters for KDE, with the same level of quality and care. Season of KDE 2014 is now open for applications. To apply head to season.kde.org register as a student and click "Submit a proposal". 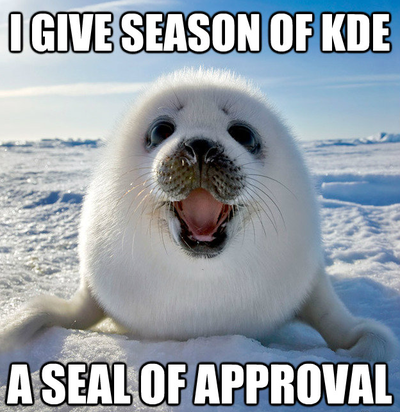 Everyone can apply for Season of KDE. We give preference to those who have applied for Google Summer of Code and to students, but we will gladly consider applications from anybody interested to contribute to KDE. A great season working on a really cool KDE project and gaining valuable experience. If you complete your project successfully you also get a T-shirt, a certificate and maybe a few other goodies. Also a great project to boost your C.V. too! Season of KDE is a flexible project to fit around school terms, work, and other commitments, and start and end dates can be discussed with your mentor. Projects should be completed before the end of the year, a typical Season of KDE project should take around 2 months. This year, we are planning to host it in Autumn from Oct 17, 2014 to Jan 31, 2015. Then head to season.kde.org and follow the instructions provided there. It is preferred. Ideally, you should contact a KDE subproject well before applying, ask for feedback on your idea if you have one, and request a mentor directly. A list of KDE subproject contacts is available on the Google Summer of Code 2014 ideas page. You can also apply without a mentor and we will try to find one for you. It is preferred. If you do not have one, we will try to find one for you! But generally for a successful project completion proposal helps a lot! This way you can actually get to know a lot more about how your idea is going to be implemented. Keep in mind that KDE is huge, so you should have an idea of which KDE subproject you wish to work on. You should visit the Sok 2014 ideas page too. What if I do not get a reply from a mentor within some days or have some other queries about SoK?